While overall crime in the United States has continued to fall, violent crime, notably murder, rose in the last two calendar years after a long period of decline. That increase turns out to have been entirely in metropolitan areas, especially Chicago. 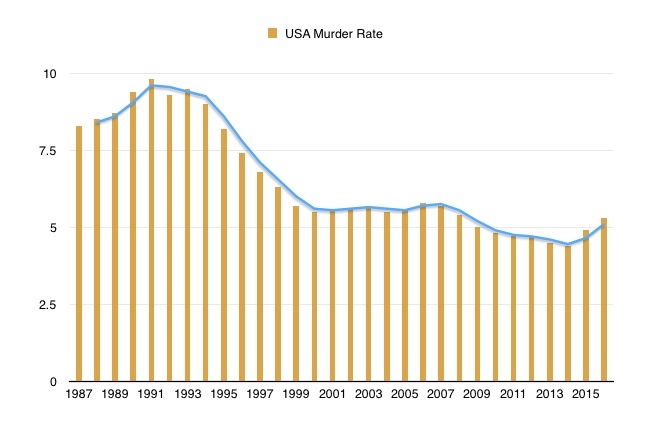 In the rest of the country (even in some large cities such as New York) the murder rate is still going down. Preliminary data from major cities so far this year suggests that 2017 will likely follow the long-term trend of falling crime rates, which are down by nearly half since 1990. As Marshall notes, this is an important number to track because murder is the most serious of crimes, and the murder rate is a pretty solid indicator since murders rarely go unreported. I would add that it's also a relatively small fraction of violent crime and of crime in general, and it's statistically noisy and subject to distortion by a surge of murders in a few cities or regions. That said, the U.S. murder rate rose from a low of 4.4 per 100,000 persons in 2014 to 4.9 in 2015 and 5.3 in 2016. That's obviously not good. But it's also a bit misleading. A more detailed breakdown of the FBI report by the Brennan Center for Justice at the New York University School of Law points out that the overall crime rate fell by 1.4 percent last year. In fact, crime has gone down for every one of the past 15 years (and there's reason to expect it to decline in 2017 as well; see below). Moreover, the increase in the murder rate during 2016 was concentrated mainly in large cities. According to an earlier Brennan Center report, Chicago alone accounted for more than 55 percent of the increase across the 30 largest U.S. cities. In contrast, as mentioned in a blog post a few weeks ago, the murder rate in New York City was down again last year. Also, outside of metropolitan areas, the U.S. murder rate in 2016 fell by 6.7 percent. That is, the rise in murders in 2015 and 2016 took place mainly a few cities and regions, not the country as a whole. To be clear, I'm not suggesting that there's no cause for concern. The rise in violent crime in 2015 and 2016 isn't good. At the same time, a two-year increase doesn't prove the existence of a longer-run trend (especially since the data for 2017 so far point in the opposite direction). The United States is not in the grip of a skyrocketing crime wave, as some would like us to believe for reasons of politics or ratings. The overall crime rate for violent and property crimes combined is still down by nearly half since the start of the 1990s to levels typical of 50 or 60 years ago. The reasons for the long-term fall are unclear, but one possible factor is, perhaps surprisingly, the phaseout of leaded gasoline decades ago. Even very low levels of lead poisoning in children can lead to behavioral problems in adolescence and adulthood, and measures of declining atmospheric lead concentrations track closely with the fall in crime rates years a couple of decades later, as journalist Kevin Drum has frequently written. Another possible influence is an increase in the number of police in the 1990s. (The likelihood of being caught has a greater deterrent effect than such measures as the duration of prison terms.) On the other hand, intensive policing that alienates people, such as New York City's stop-and-frisk policy of a few years ago, doesn't appear to help, since crime continued to fall after the policy was ended. To summarize, the short-term rise in violent crime statistics in 2015 and 2016 shouldn't be ignored but neither does it suggest a crisis. Even despite that increase, both violent and property crime remain at historically low rates and there's reason to think the murder rate in 2017 will be lower. And while it's not entirely clear why crime rates have fallen of the past quarter-century, the fact that they have suggests it's a problem that can be dealt with.